Hoping to finish up my Holiday cards and drop them in the mail this week. 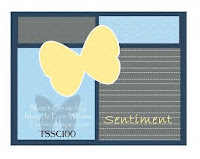 Here's a quick and easy card using MJ's TSSC100 - just love these easy sketches. I'm sure you'll be seeing this sketch again real soon! 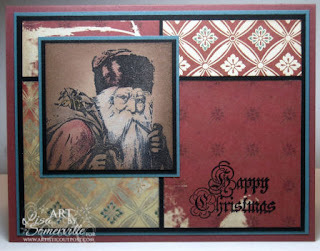 I stamped the Santa from the Artistic Outpost Snowy Woods Plate in Black Archival on Caramel card stock. I used the Sepia Technique to add color to the image. Following the sketch, I used Cosmo Cricket Papers for my background panels, and stamped the sentiment from this same plate using a SAMJ. Lisa, this card is great, I love how you used the turquoise on it. The coloring is gorgeous. I'm hoping to squeeze in this layout, think I might head to the dungeon in a bit. I have that stamp set pulled out to use this Christmas as well. Whoops, almost missed this one. I love this image. I am finally done with my Christmas cards too! I am moving on to the next holiday now. Thanks so much for playing Lisa, your cards are always terrific.